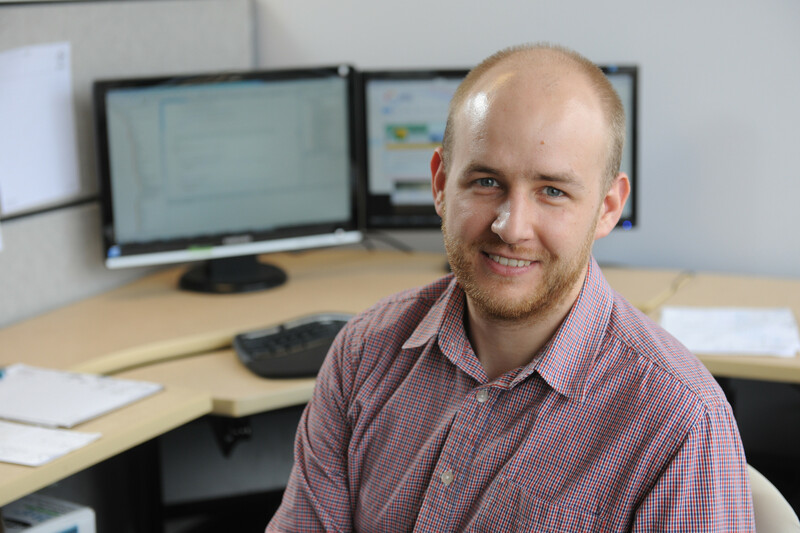 Recent Dalhousie PhD graduate, Marek Lipczak, has been sponsored as a Mitacs Elevate postdoctoral fellow at Halifaxbased Oris4. The Mitacs Elevate program provides matching funds to Canadian companies for hiring new PhD graduates. This way, small-to-medium enterprises (SME) can afford to hire highly skilled people who can significantly add to their research and development capacity, and ultimately contribute to their innovation-based success. Through Mitacs Elevate, new PhDs create and lead a major industrial research project while also establishing vital connections within the local business community. Postdoctoral researchers will gain an appreciation of the economic impact potential of applied research. If they choose a career within industrial research, they will contribute to Canada’s competitiveness through the development of new products and services. If they choose an academic career within a Canadian university, their skills will be applied to strengthening the transfer of technology from academia to industry, and vice versa, an area which has been identified as weak in Canada compared to other industrialized countries. A Mitacs Elevate fellowship is a partnership among the fellow, the industrial partner and an academic supervisor. The academic supervisor provides mentorship and research support to the fellow, while also providing research expertise to both the fellow and the industrial partner. The fellow’s time is shared between the organization’s site and the university, with a minimum of 50 per cent of the time spent within industry. The ultimate goal of creating a conduit for knowledge transfer between university and industry is helped by engaging graduate students with research problems and helping to promote their research through publications at conferences and in academic and industry journals. Dr. Lipczak’s next two years will be spent working with the Oris4 innovation team to enhance the intelligence in text mining of the company’s flagship product which is aimed at exploiting a gap in the Enterprise Content Management (ECM) market. ECM is one of the fastest growing areas in enterprise software. It is a solution that keeps an organization’s documents and other unstructured content organized in a manner that people can easily find it. Oris4 is targeted at SMEs, research teams and individual knowledge workers. Dr. Lipczak’s thesis research in the field of tag recommendations in social bookmarking and tagging services was a natural fit for this team. “We recognized that Marek’s research, code quality and great attitude would be an excellent fit for where we are taking Oris4,” says Peter Hickey, President. “Oris4 is a technology that self-organizes information in an intelligent manner that allows users to find it quickly. Tagging is a task nobody likes and few do well,” he says. “Marek’s work can significantly improve the process and experience for users.” His thesis work has potential application to the automatic tagging of text resources, leading to significant advances in searching small-scale document corpora, which will enhance the capabilities of Oris4 and contribute to its success in the marketplace. “For me, it is especially interesting because thanks to the development of a Social Web providing large amounts of training data, we observe a great improvement in the applicability and accuracy of the machine learning algorithms that I am working on,” says Dr. Lipczak. “We have discovered a few areas where my experience from university can be applied to the development of Oris4, bringing it to a completely new level of intelligent interaction with the user. These improvements should lead to new, even more exciting research problems”.